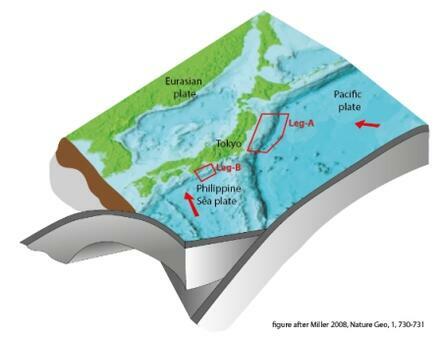 At the southeastern edge of the Eurasian Plate, Japan hosts two of the most interesting subduction systems, both prone to devastating megathrust earthquakes: The Japan Trench (JT) east of Honshu with subduction erosion/subsidence in the north, and the Nankai Trough (NT) with a huge accretionary prism in the southwest. In 2011 the Japan Trench area was struck by a Magnitude 9 earthquake that caused unusually large slip all the way to the trench, and a series of landslides which are believed to be partly responsible for amplification of the catastrophic tsunami following the event. At Nankai, frequent Magnitude 8+ earthquakes are also documented, and landslides and other sediment remobilization processes related to seismicity are attested. The overarching goal of R/V Sonne cruise SO251 and subsequent post-cruise research is to investigate fluid- and sediment mobilization processes by mud volcanism, earthquake-triggered seafloor displacement, submarine landslide and related “paleoseismologic event deposits” and to compare inferred earthquake processes and rates along accretionary vs. erosive subduction margins of Japan (Nankai Trough and Japan Trench, respectively). The cruise is divided into two parts: We will first conduct mapping and coring along the deep Japan Trench and along the upper slope and forearc escarpment from 36°N to 40°N. After a short mid-cruise port-call to partly exchange the science crew and uptake ROV and ROV team, we will then continue to the Kumano Basin in the Nankai Trough working area to pick up instruments in the mud volcano field by ROV followed by further mapping, coring and detailed video surveying of seafloor in the shallow splay fault area. Post-cruise science will be coordinated among the international science party. With SO251 we will establish a bathymetric and sedimentary inventory of mass-movements, chronology of extreme-event deposits and their paleoseismologic interpretation. It further will investigate geotechnical aspects of earthquake-triggered mass wasting processes to allow for quantitative interpretation and comparison of the established event catalogue. We also will illuminate the relationship between mud volcanic activity (mudflows, seepage, etc.) and local seismicity by using long-term data, time series samples and additional core/data from the cruise. Anticipated conceptual advance in our understanding of sediment dynamic processes related to subduction zone earthquakes are expected to be transformative and may well apply for other active convergent margins worldwide, not just Japan and the circum-Pacific.